Quite possibly a "best all-around" cabin for its long range view, convenient location, roomy floorplan, stylish decor, not to mention having 2 king bedrooms... 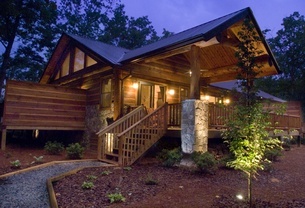 This hand crafted log home is minutes from the Nantahala River or Fontana Lake and yet provides privacy and seclusion. Also, it is located on our 50-acre tract we call the Watershed Resort. What is the Watershed Resort? We have produced a video to answer that question and many more on the 'about us' page of the Watershed Resort website. 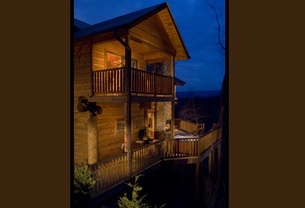 Quite possibly a "best all-around" cabin for its long range view, convenient location, roomy floorplan, stylish decor... 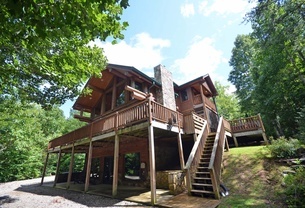 This hand crafted log home is minutes from the Nantahala River or Fontana Lake and yet provides privacy and seclusion. And wow, take a look at the downstairs master suite! Also, it is located on our 50-acre tract we call the Watershed Resort. What is the Watershed Resort? We have produced a video to answer that question and many more. 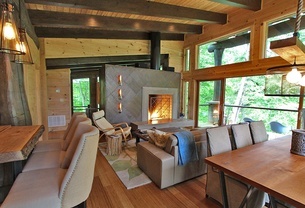 The highlight of this cabin is the master bedroom suite on the lower level. It features a king bed and fireplace. 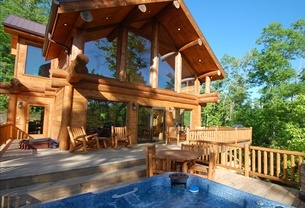 The cabin also has a pool table, outside fireplace, hot tub, and long-range view. 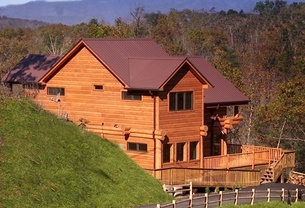 This and all other cabins on our Watershed Resort property are only minutes from town or from the Nantahala Outdoor Center. What is the Watershed Resort? We have produced a video to answer that question and many more. 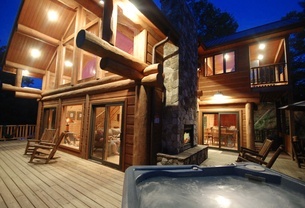 See the Watershed Resort website for a video tour and other details about this popular property. Special pricing has been set up for combining the 2 cabins together. Watershed 11 with 2 bedrooms and Watershed 12 with 3 bedrooms, are walkable between each other via a short path. Pricing these cabins together gives a little bit of price break from just paying the sum of the 2 cabins individually. If either cabin is already booked, then this combo is not available. 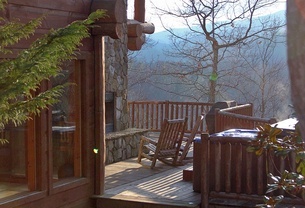 Also, these cabins are located on our 50-acre tract we call the Watershed Resort. What is the Watershed Resort? We have produced a video to answer that question and many more, so please see the Watershed Resort 'about us' page. For detailed descriptions of this combo of cabins, please see the individual cabin listings for the Watershed 11 and Watershed 12 cabins. Watershed 8 is a custom-built home with the distinction of being the one spot in the near vicinity that can see Fontana Lake when full. The interior is spacious and tastefully decorated, and we've added WIFI and a Nintendo Wii game. 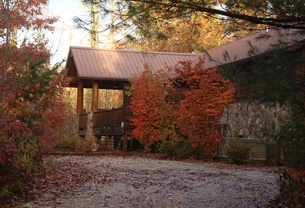 This cabin is located on our 50-acre tract we call the Watershed Resort. What is the Watershed Resort? We have produced a video to answer that question and many more. Treehouses are our one-bedroom units in a 4-plex building. Designed just for 2 people to enjoy, each unit has a private patio area with gas grill, hot tub, and fire pit. We limit occupancy to 2 and allow service dogs only to preserve the quiet surroundings. Unit C is one of the most private units because it is in the back corner of the building and opens to nothing but dense woods. This cabin is located on our Watershed Resort property, which features amenities such as hiking trail, teepee, and waterfall. 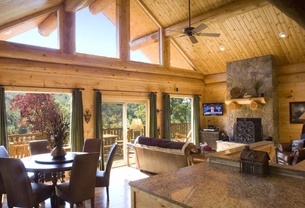 Watershed 12 is a hand-crafted log home features almost 2000 sq feet of living space with spacious rooms and lots of sleeping capacity. For large groups, combine this cabin with Watershed 11 just next door. Treehouses are our one-bedroom units in a 4-plex building. Designed just for 2 people to enjoy, each unit has a private patio area with gas grill, hot tub, and fire pit. We limit occupancy to 2 and allow service dogs only to preserve the quiet surroundings. Treehouse B is one of the units with a covered deck area. At the Woodland Lofts, each unit stands separately with its own deck and hot tub. The setting is a small commune-like area on our Watershed Resort property. The 3 lofts share a common fire pit, grilling/dining area, and parking. Except for the deck layouts and some styling and color variations, these units are identical, so the photo galleries all show a collection of photos from all 3 units. The availability calendar shown for each unit is accurate for that specific unit. The custom modern design by the owner of Watershed himself and the construction with repurposement and other environmentally-friendly methods as a focus make this home special. 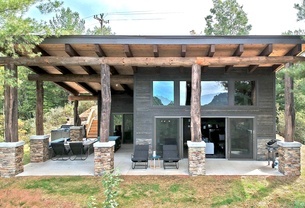 This 'mountain-modern' cabin with its chic industrial loft elements styled with a mountain flair sits perfectly on a private lot with a long-range, sunset view of Sassafras Gap. Treehouses are our one-bedroom units in a 4-plex building. 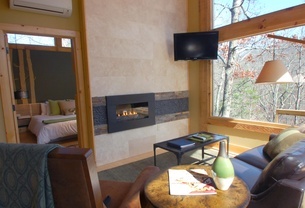 Designed just for 2 people to enjoy, each unit has a private patio area with gas grill, hot tub, and fire pit. We limit occupancy to 2 and allow service dogs only to preserve the quiet surroundings.